Presiding over the mighty Mississippi, the Hilton New Orleans Riverside is a short walk from nearly everything you will want to experience in New Orleans. Fall in love with the French Quarter, share the excitement of the Warehouse/Arts District, or try your luck at Harrah’s Casino. Connected to the hotel you’ll find the Riverwalk Marketplace, featuring more than 140 shops and restaurants. You can also visit the Louisian Children’s Museum, IMAX Theater, The National World War II Museum, Superdome and the Riverfront Streetcar. 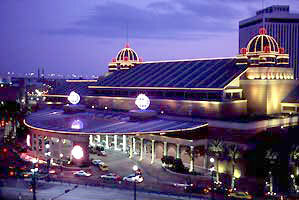 And the nightlife, it’s all here, just steps from the Hilton New Orleans Riverside. New Orleans is know for its music. With musical roots that run as deep as the Mississippi, you can enjoy live music any night of the week. Just steps from the French Quarter you will find Frenchman Street, a two-block stretch in the Faubourg Marigny neighborhood that is home to over a doze live music venues playing everything from jazz to latin to blues to reggae. For a list of the music venues throughout the city, visit New Orleans Online. To see who is playing, visit the Music Calendar. Experience the magic and mystery of New Orleans’ unique architecture, history, art, music and shops that makeup the French Quarter. Don’t be fooled by the common interpretation of the French Quarter because it is so much more than anything you could expect. In a city famous for music, the streets of the French Quarter are swinging every night of the week. No matter your age or interest, there is music for every ear wafting out of clubs and restaurants. Indulge yourself with local delicacies andunique flavors of the world-renowned restaurants that line the streets of the French Quarter. Bourbon Street, although this historical French Quarter street has a bawdy reputation due to the burlesque clubs and all-night partying, experience a whole other side of Bourbon Street steeped in history, folklore and beauty that dates back to the 1718. A favorite among visitors and locals, you will want to experience Jean Lafitte’s Blacksmith Shop located on the corner of Bourbon Street and St. Phillip. The bar is full of legends, mystery and days of old New Orleans. This historic neighborhood is filled with amazing art galleries, fine restaurants and world-class museums. The Warehouse District was originally established as an industrial area in the 19th century to store grain, coffee and produce that was shipped through the Port of New Orleans. Today more than 25 art galleries call the district home. Most are located on Julia Street where you will find a mix of art lovers and socialites on first Saturday night of every month. You will also fund the Contemporary Arts Center and the National World War II Museum amongst the district streets.